I always say you can never do enough analysis. 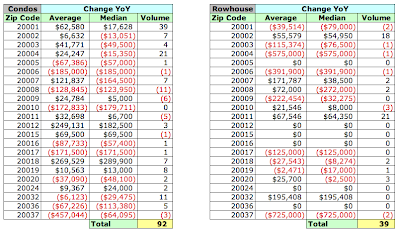 In that spirit, after having posted sales recorded in the District in February 2007, I wondered what the YoY changes for each zip code by category of housing would be. The results of my insomnia are displayed below. 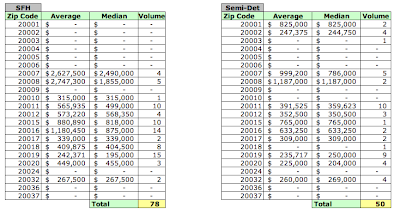 I've taken sales recorded by the District in February 2007 and compared the average and median sales price and sales volume for each zip code by housing category to those of February 2006. 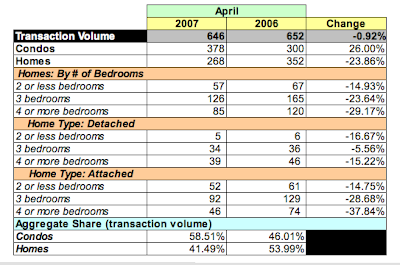 Basically, 156 more units were sold YoY in February 2007. 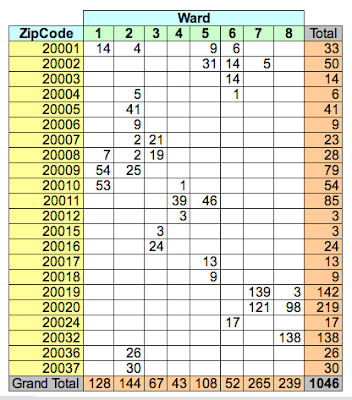 To understand the table, let's look at zip code 20003. Eight more units sold YoY while average and median prices declined YoY. 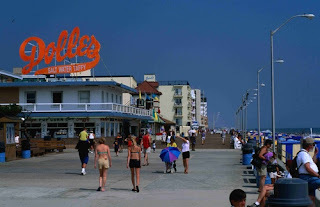 Condos: Condos sold in all zip codes. Average prices declined in 10, 14 had lower median prices, and only 6 experienced lower sales volume. Sales are higher while prices are lowering. 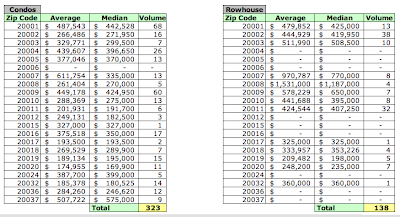 Rowhouses: Sales in 16 zip codes. Average prices fell in 9, median fell in 11, and sales volume dropped in 6. 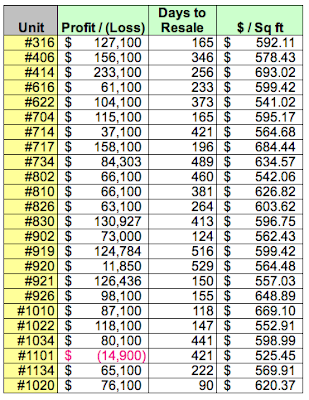 SFH: Sales in 13 zip codes. Higher average prices in 9, higher median prices in 8, and higher sales volume in 4. Semi-detached: 14 zip codes had sales. 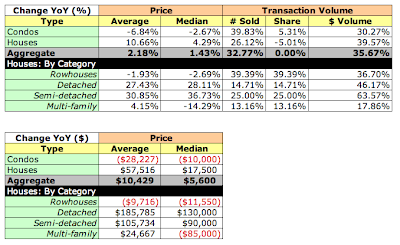 Higher average and median prices and sales volume in 9, 8, and 8. 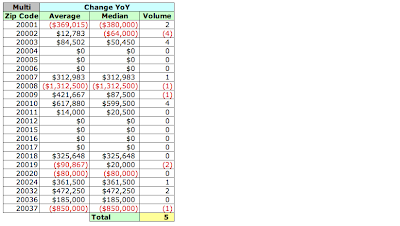 Interesting to see the price changes when the sales volume is the same YoY. Multi-family: Of 15 zip codes that had sales, higher average prices in 10, lower median prices in 5, and lower sales volume in 5. How're prices doing in the wards? The data show that except for Wards 1 and 5, average prices are up in all wards. 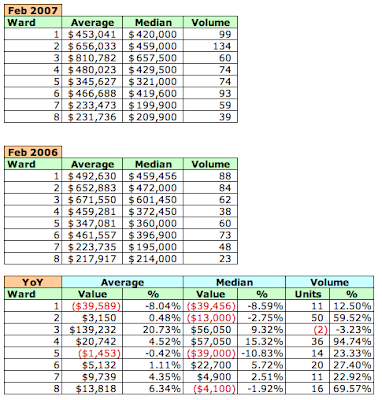 However, half the wards (Wards 1, 2, 5, and 8) have lower median prices YoY. Wards 1 and 5 are seeing lower prices on higher sales volume (12.5% and 23.33%, respectively); Ward 8's median sales price fell although sales volume was up almost 70%. Sales volume is higher in all wards save Ward 3, which experienced a very minor downtick. Ward 4's sales volume almost doubled in the year; interestingly, that ward's average price rose a modest 4.52% while its median sales price rocketed 15.32%, the highest of the wards. 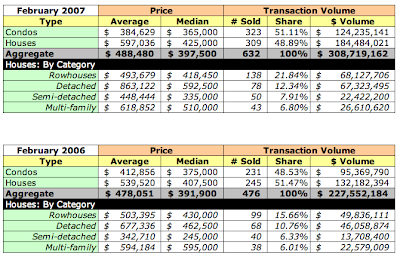 As I mentioned yesterday, I've finished collecting and scrubbing [correcting] full value residential sales the District recorded in February 2007; the data have been uploaded to DCHomePrices.com and DCCondoPrices.com. Unlike MRIS, my data and analyses include new units [primarily condos] so there will be some differences in my conclusions about the market's state compared to a similar analysis based solely on MRIS reports, which only report sales of existing units sold and/or listed by real estate agents. Also, this analysis is of sales recorded by the District in February as opposed to sales settled in the month, which is what MRIS reports, so there will be some discrepancies because of timing issues. However, I believe the data do provide an indicator of trends in the District that could be useful. In February 2007, 632 residential sales were recorded by the District. The majority of sales, 51.11%, were condos. However, given their lower average prices as compared to houses, the condo dollar volume was 40.24% of the total dollar volume of $308.7MM. Compared to February 2006, aggregate average and median prices were flat while unit and dollar volume jumped 32.77% and 35.67%, respectively. Those four buildings alone represent 20% of all condo sales recorded in February. 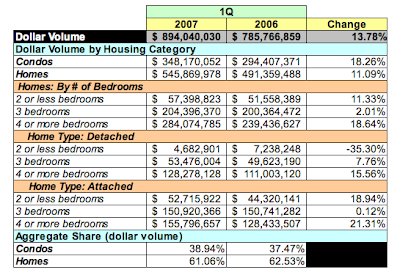 Single family homes had a 26.12% jump in unit volume and grew almost 40% in dollar volume. Average and median prices were a mixed bag for single family homes. Rowhouses experienced declines in both YoY and multi-family experienced lowered median prices. Otherwise, all categories of single family homes showed increases. Note: I classify multi-family homes as single family homes because I've found that homes that once were multi-family which have been converted to single family use have not been reclassified as such by the District. I may be painting too broad a brush here, but I can live with it. 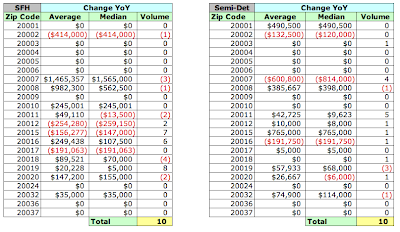 February 2007 average and median sales prices and unit volume by zip code. Update: I fixed an Excel error. The values listed below are correct. Believe it or not, the District finally completed loading sales it recorded in February 2007, just in time for the Memorial Day holiday. At least I hope that's true; I've encountered instances when sales data was loaded months after the fact. I've cleaned the data - a never-ending story - and geocoded it. No $88MM condos this time. It's now available on DCHomePrices.com and DCCondoPrices.com. I'll publish the sales analysis tomorrow. The National Association of Realtors (NAR) recently reported that sales of existing homes in DC rose 9.3%. Given NAR's reporting methodology, I didn't want to assume that the data reported for DC is really based on local data [I'm not a statistician, but NAR's explanation of their methodology doesn't lead me to believe DC was necessarily in their data sample]. Furthermore, NAR's report doesn't provide an indicator of the market's characteristics or underlying trends. 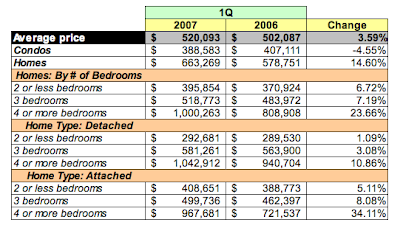 So, using MRIS data, let's compare 1Q2007 / 1Q2006 sales of existing homes and condos, which should provide a broad base of comparison and help identify trends in the current DC market. Aggregate dollar volume, average prices, and transaction volumes are up YoY. 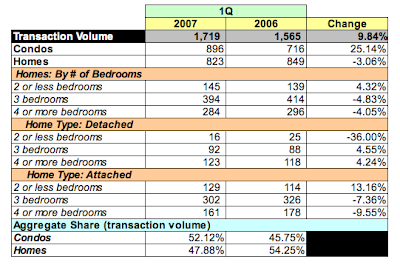 MRIS data show that sales volume is up 9.84%; pretty close to NAR's report. Sales volume of homes is down 3.06%, condos sales are up a whopping 25.14%. The average price of a condo fell 4.55% while that of homes was up 14.6%. Sales volume for 3 and 4 bedroom homes fell by at least 4.05%; 2 bedroom homes saw a 4.32% bump upwards. 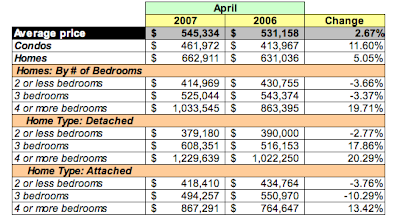 Homes with 4 or more bedrooms, which I've previously labeled high end homes, are doing quite well. Average prices are up 23.66% despite a 4.05% drop in sales volume. Homes have a dominant share in dollar volume while condos constitute more than half [52.12%, to be precise] of all units sold. As I've noted in previous posts, sales of high end homes are skewing data for home sales; these homes represented 31.78% of the dollar volume although they were only 16.52% of the unit sales. When high end homes are excluded from the analysis, average home prices are up 6.62% vice the 14.6% shown below. While more condos are selling, they're selling for lower average prices. Sales volume. A huge spike in condo sales volume, up 26% YoY. However, all categories of single family homes saw a decline in sales volume: -14.93% for 2 bedroom homes; -23.64% for 3 bedroom homes; and -29.17% for 4+ bedroom homes. Dollar volume. Declines across the board except for condos, up 40.61% vice -20.02 for single family homes. Average sales price. Overall, pretty good. In addition to the whopping increase in sales volume, average prices for condos grew more than 11% to $461,972, while homes saw a 5.05% bump YoY to $662,911. Days on market. Yes, on average the DOM grew to 73, but a closer look shows that almost 2/3 of all homes sold within 60 days. Not too bad. So what to make of all of this? Well, in terms of sales and dollar volume the market definitely shifted to condos. 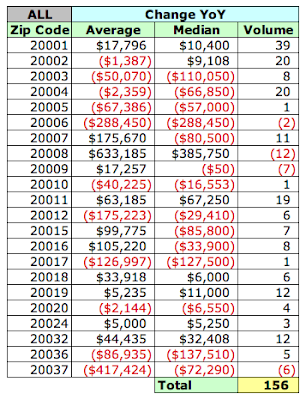 Nineteen of the 378 condos sold in April sold at prices of $1MM or higher compared to about 9 in that price range in April 2006, which I suspect 'distorted' April's results. That, coupled with the 17.35% increase in average prices for high end homes, would probably explain the increase in average sales prices for condos and single family homes. Condo Sales: Anything under $250,000? A few weeks ago, "Mom in Indiana" wanted to know whether it's possible for her son to buy a 2/2 condo in the DC area for around $275,000; I thought not. Another person asked about condos in the $250,000 price range. 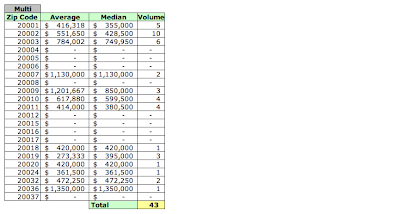 So I decided to do some research on condo sales in the District to see what percentage were sold for $250,000 or less. 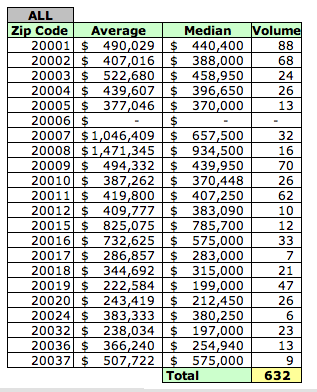 It turns out that of the 9707 sales recorded by the District in the period 1/1/2006 - 1/31/2007, 4833 were condos, or 49.8%. Of those, 1046 were sold for $250,000 or less. In other words, condos costing $250,000 or less comprised about 10.8% of all sales made in the District. A quick glance at MLS shows that right now slightly more than 400 condos are being offered for sale for $250,000 or less. 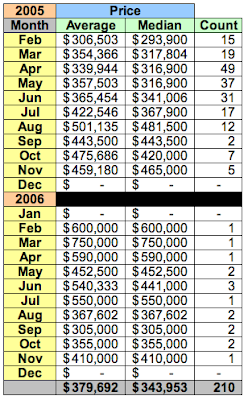 The tables below show my analysis of sales made through 1/31/2007. Unfortunately, I don't have all the data [or the database skills] I need to tell which are studios or one - or two-bedroom units. My first cut at the data was to see sales by zip code by quadrant. I wanted to see whether any one quadrant dominated the market. NW and SE DC dominate sales, with zip codes 20019, 20020, and 20032 comprising 47.7% of sales. I then looked to see which Wards led sales. Given what I found above, it shouldn't be too surprising to see that Wards 7 and 8 led sales in the price range. So where are the condos costing $250,000 or less? All properties in DC are located on squares, which are then subdivided into lots. I ran a report on all condos sold during the period in the District, counting sales by square. I then identified the top ten squares in the District, which is detailed in the table below. These ten squares accounted for 292 condos that sold for $250,000 or less, about 27.9% of all condos sold in that price range in the period. Seven of the squares are located in SE DC, with one in NW DC and two in NE DC. Often the high ranking is because of the sales in one condo building, such as square 6164, the location of Brandywine Crossing, that recently "delivered" its units. I have to tell you, I'm not a huge fan of the 700 block of 7th St NW. I think what really sets me off is that blaring TV jumbotron at 7 and G, the lack of street parking, and all that congestion [I'm getting old]. However, I get my hair cut at Bang [Mark's great], the Verizon Center is there, and the Poste Moderne Brasserie in the Hotel Monaco is pretty good. So, what should you expect to find at such an urban nexus? The Residences at Gallery Place, located at 777 7th St NW [profile here]. The Residences began delivery in February 2005; all 192 units were sold. Through January 2007, the District recorded 210 sales transactions. ...Gallery Place is the quintessential urban mixed-use destination. It sits atop the Gallery Place/Chinatown Metro station, where three rail lines intersect and give direct access to hubs like Union Station and Reagan National Airport. The access and location - equidistant to the White House and the U.S. Capitol - are superb, but the mix of uses has been the reason for its positive community impact. Gallery Place consists of more than one million square feet of office, retail, residential and entertainment space. Combined with neighboring MCI [Verizon] Center, it forms one of the largest retail/entertainment venues on the East Coast. Being risk takers, I'm sure the developers, Akridge and Western Development, were encouraged in their efforts by a $9MM subsidy from the District and $50MM in tax increment financing (TIF). 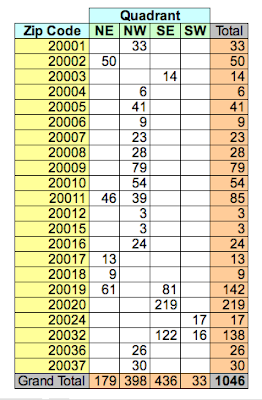 The District recorded 210 sales transactions (including 24 flips) through the end of January 2007. Information on individual sales can be found at DCCondoPrices.com. #913: 2/2, $579,900. At this price, the owner achieves a $38,000 profit. "Seller will pay up to 3 year's worth of half of each months condo fees." Or, 1.5 year's worth. Incredibly, it's never been occupied, aka, "lived in." #934: 1/1, $369,000. A $67,100 profit. #1002: studio, $299,000. MLS ID #DC6331999. Profit = $67,100.